You are here: Home / Party & Holiday / Holiday Decor & Crafts / Christmas / Easy Front Porch Christmas Decor in Minutes! 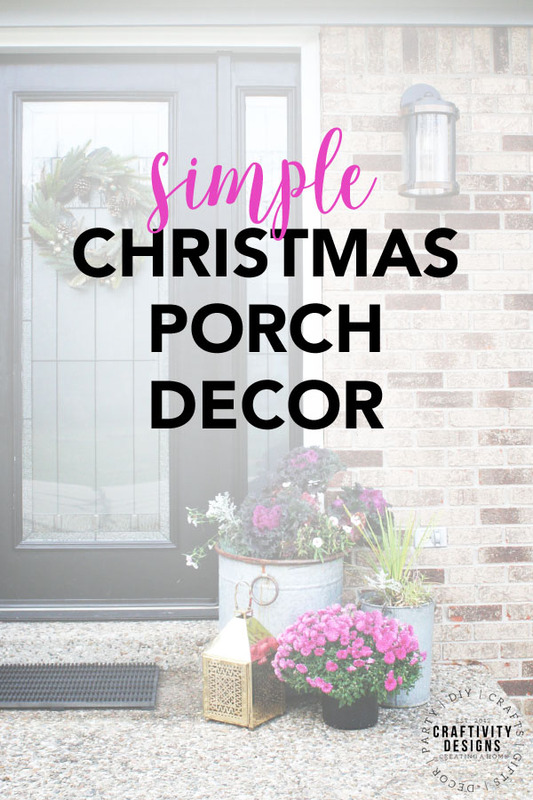 The holiday season is busy, so choose front porch Christmas decor that is easy to set up in no time. With simple outdoor Christmas decorations, you can have a festive home even when you are short on time. As a shop owner and blogger, Christmas is the busiest time of year. We’ve spent 3 of the last 4 weekends at craft shows, and we fill online orders on the weekdays. Therefore, Christmas decorating has to be simple for our family. 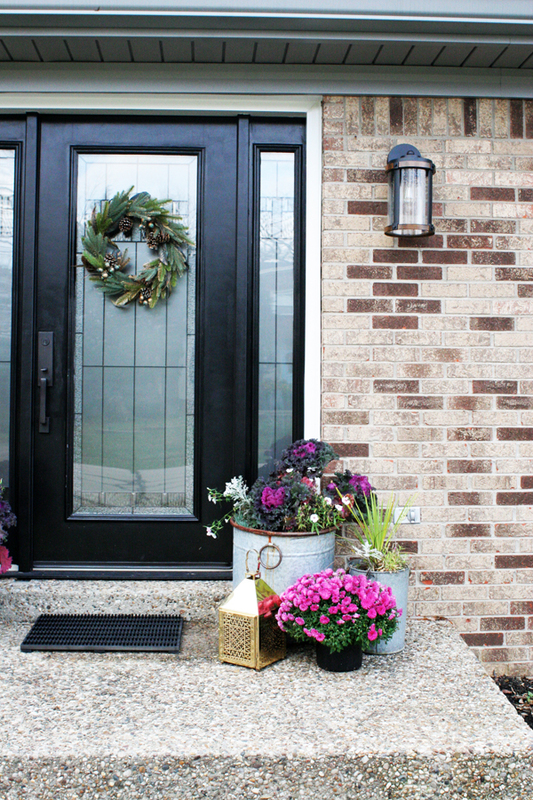 Our front porch Christmas decor is no exception, easily pulled together in only a few minutes. 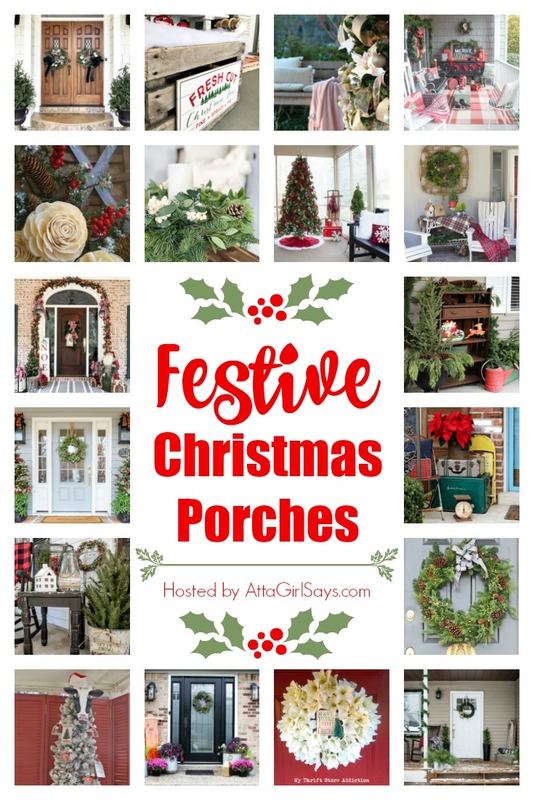 I’m sharing our exterior decor as part of the Christmas Porch Tour, organized by our hostess Amy, from Atta Girl Says. 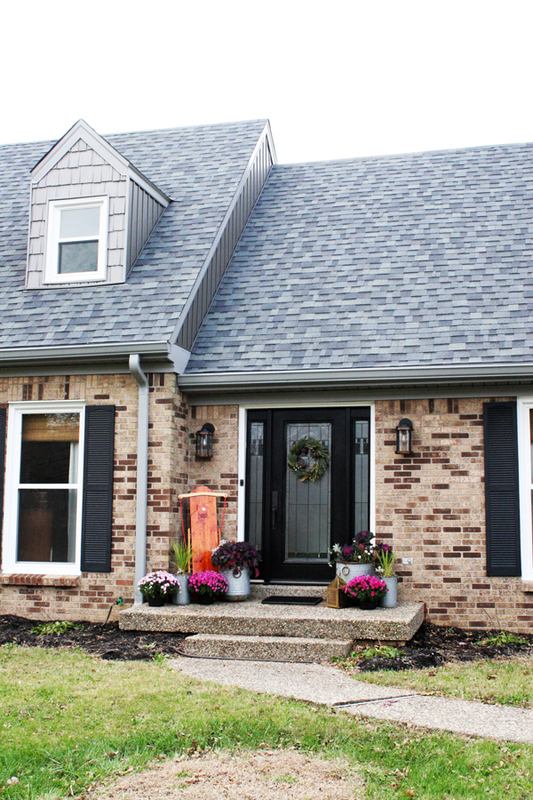 At the end of the tour, make sure to visit the rest of these beautifully decorated homes. Some of you saw a wide-view shot of our home during the Cottage Christmas Tour, but today I’d like to talk more about the details. 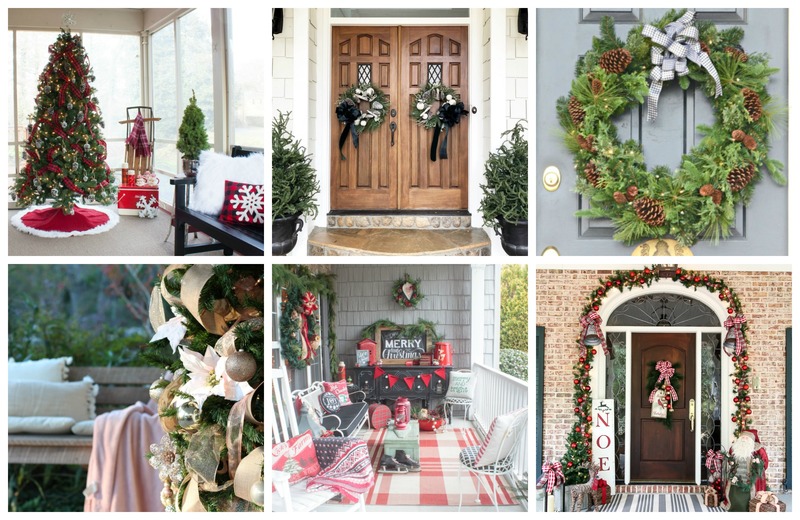 We’ll walk through 4 easy tips to decorate a front porch for Christmas, in no time. First, choose an anchor item. Ideally, something tall, like our wooden sled. It’s large enough to easily be spotted from the street, and it catches the passerby’s eye. Our sled is one we’ve owned for years… and it breaks every time we use (womp-womp). Rather than continue to repair it, we’ve decided to repurpose it as holiday decor. Don’t have a sled and need other ideas for anchor pieces? 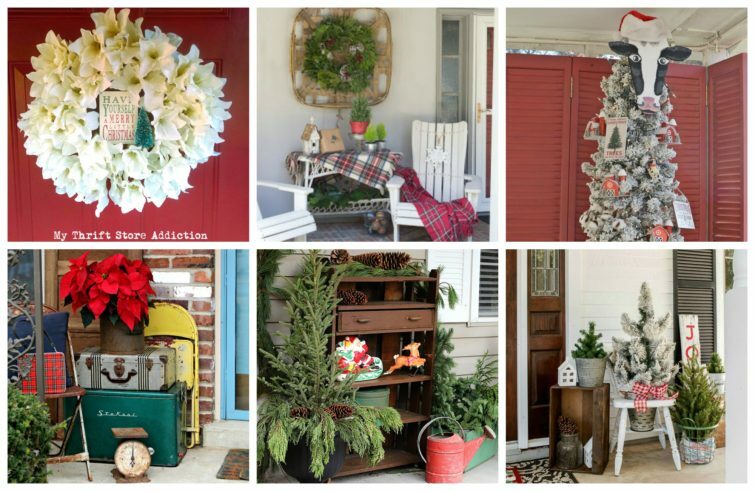 Check out the outdoor Christmas decorations in this post for more ideas. Next, fill the porch with summer and fall planters. Live in a midwestern city like me? 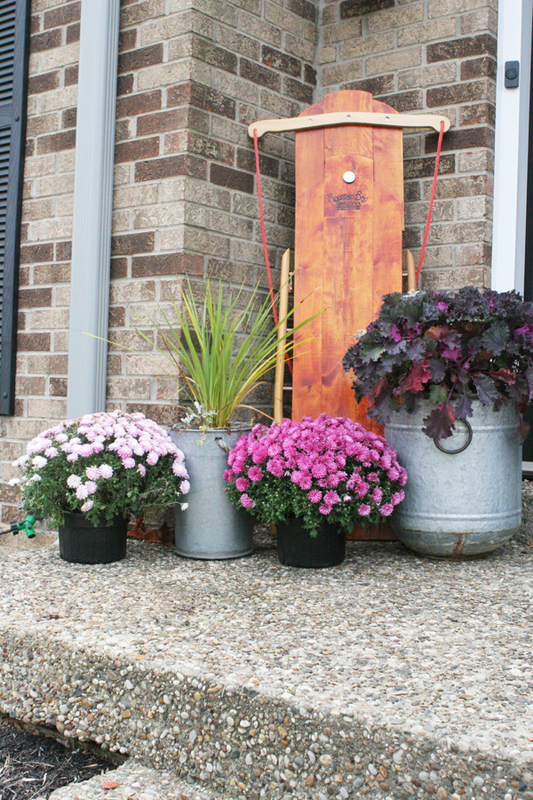 Extend the life of colorful mums by pulling them inside (or covering them) for cold nights. Or, if your plants are long gone due to frost, snip evergreen limbs and tuck them in the dirt, hiding the dead plants. Our ornamental lettuce and tall grass plants are still hanging on, though the mums have started to fade away. But I’ve loved continuing to embrace the color into November and December. Don’t feel tied to poinsettias and holly, as the only Christmas fauna. 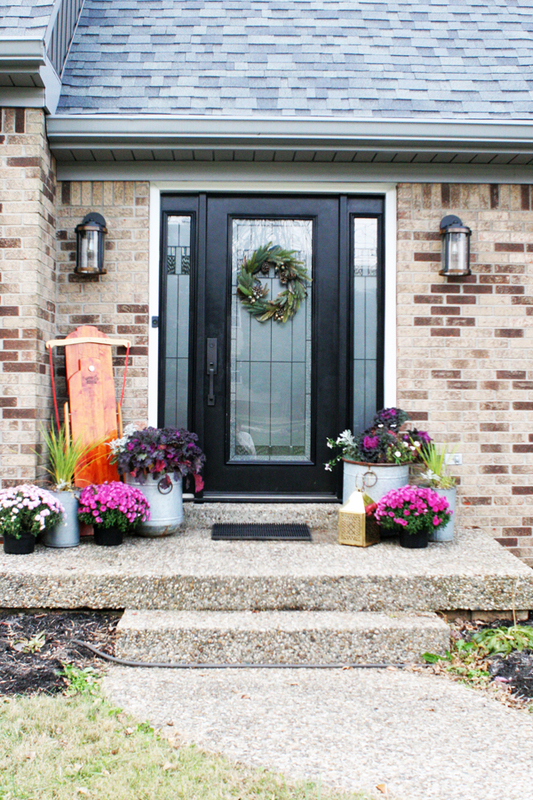 Groups of tall, medium and small planters fill a porch and give it that cozy, welcoming feel you want for the holidays. Third, add something shiny. All that glitters is not gold… but it sure is Christmas-y! A brass lantern catches the light and provides an element of the glitz and glam of Christmas, in an understated way. No shiny lantern? Try a gazing ball, a giant outdoor Christmas ornament, or a wreath filled with shiny ornaments. Fourth, hang a wintery wreath. 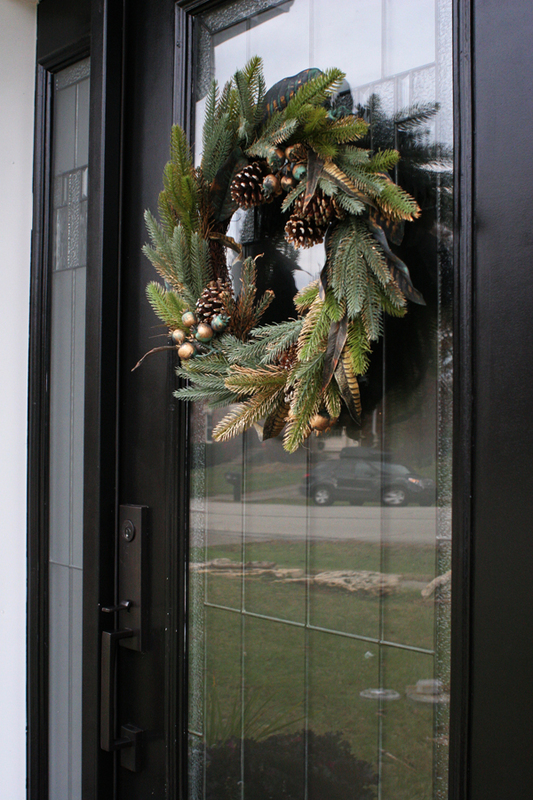 For our black front door, I chose a green and gold wreath. It picks up the tones in the brass lantern and the green and black combo is a Christmas theme you’ll see throughout our home’s decor (like this rustic Christmas table). Have a glass door like me? I’ve been testing wreath hangers that work on glass, and these are my favorites. A few more pictures for fun, because, why not? 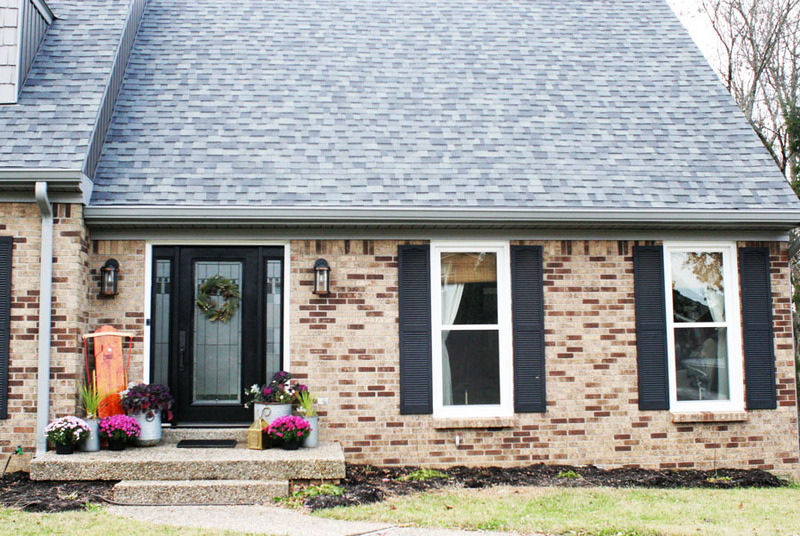 Oh, and make sure to check out the front of our cottage style home, before we completed the exterior renovation. Follow the links, below, for the full Christmas porch tour lineup! Featuring 17 more home decor bloggers, with different design styles, color palettes, and home architecture. 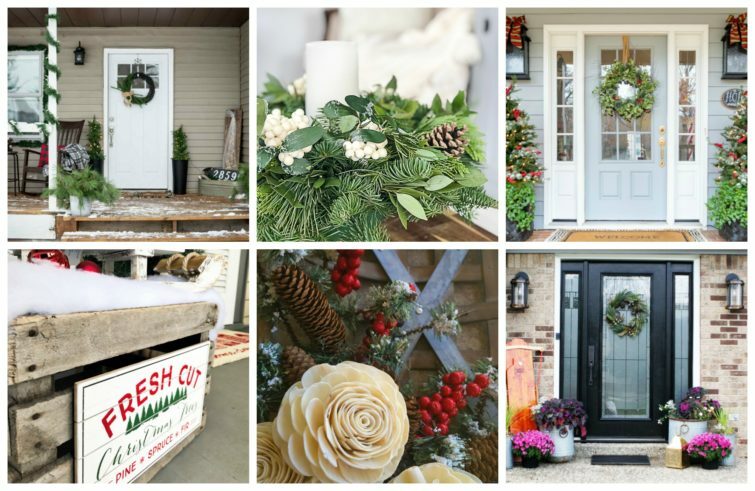 Be sure to visit everyone for lots of ideas to add festive touches to your porch and other outdoor spaces. I love your porch decor. It is simple and perfect for welcoming the season. It was fun touring with you this week! Pinning! Love the pops of color! It was fun “hopping” with you! This is so pretty, fresh and welcoming! The use of the mums is so unexpected and fabulous!! 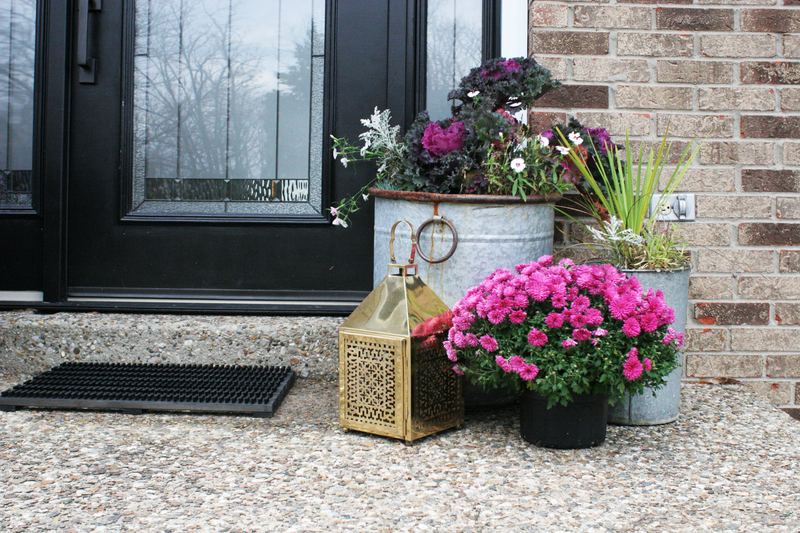 You know we’re suckers for galvanized bins – LOVE all the fresh flowers you’ve added. It’s all so perfectly simple and charming!